Great sound and great features!!! 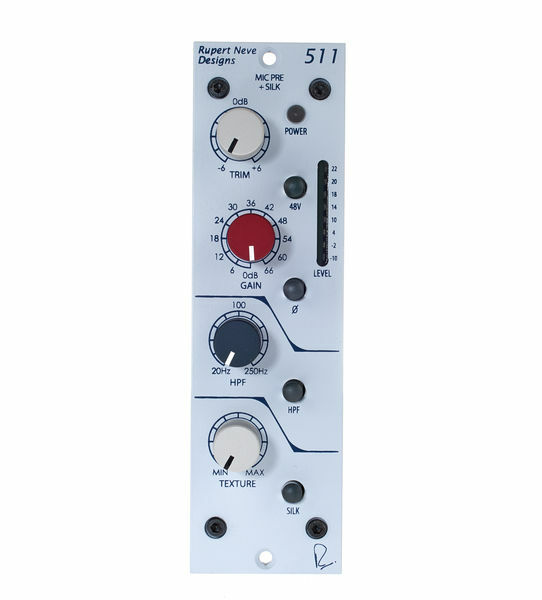 The Neve Designs Portico 511 is a great microphone preamp, capable of everything from clear and uncolored to thick and vibey sounds. The adjustable amount of silk introduces 3rd order harmonics that can be just what the doctor ordered on certain voices and other sound sources. The sweepable highpass filter is a great feature to have on any preamp to reduce unwanted rumble or lowend sounds from fans, traffic and many other sources. Tip: Record just the ambient noise of your room with the highpass off, and then bring up the signal high in your DAW and check what's going on at the bottom. All the unwanted lowfrequency energy will steal headroom when hitting your AD converters and to get rid of it before the converters is so much better than to highpass inside your DAW later. Trust me on this. This preamp is capable of truly professional recordings and at this price it is a steal. I put 4 stars on quality because one of my knobs are a little looser than the others, which I think is intended because I have 2 units and both act the same. Still, I would have preferred if they had the same smooth solid feel as the fourth knob. My first analog preamp. It does add a "silky" character to the sound. Hard to beat quality at this price point. ID: 318617 © 1996–2019 Thomann GmbH Thomann loves you, because you rock!